Originally published in 1865, Lewis Carroll’s classic, Alice’s Adventures In Wonderland, became an instant hit, but 145 years ago no one could have imagined that we would still be celebrating these characters, and in 3D to boot. This time though it’s actually Alice’s (Mia Wasikowska) second trip to “Underland,” as the 19 year old starts her journey after bolting her boring engagement party and travelling once again down the very same rabbit hole she knew as a child. 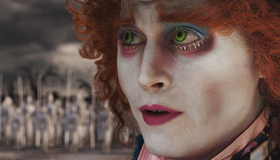 With the invitation from the very properly English White Rabbit (Michael Sheen) she soon encounters past friends—and some new ones—including, of course, the Mad Hatter (Johnny Depp), whose carrot-top like coif and piercing eyes belie the fact that he’s suffering from mercury poisoning and hiding a tragic past. Along the way there’s also the nonsensical twins Tweedledum and Tweedledee (Matt Lucas in dual roles), plus the irrepressible Cheshire Cat (Stephen Fry) with his twirling head, the March Hare (Paul Whitehouse), Absolem the Caterpillar (Alan Rickman), Bayard the Bloodhound (Timothy Spall), the nice but insecure White Queen (Anne Hathaway), the evil Knave Of Hearts (Crispin Glover) and, most deliciously, the White Queen’s sister and opposite number, the no-nonsense Red Queen (Helena Bonham Carter) who loses no opportunity to order numerous head-offings (which is ironic because her CGI enhanced head is twice as big as everyone else’s). Into this world again roams Alice, but this time she’s strong and able to overcome just about any obstacle; while her character was originally developed during another century, this Alice is clearly designed for girls in 2010 to identify with. Her encounters, whether she’s big or small, are enchanting, exciting and full of wonder, leading up to the film’s CGI-rich finale and a battle between our hero and a vicious monster. This spectacular sequence, while impressively executed, is oddly the most ordinary thing in the film—a staple of dozens of fantasy flicks with predictable derring-do—though it’s nice to see ‘ol Alice in charge. Without question the highlight of this new incarnation of Alice is the emergence of the Red Queen as her chief nemesis. As royalty/ribaldry, the plus-size-headed Bonham Carter makes this Red Queen a wickedly hilarious and twisted creation. In shouting the orders, “Off With Their Head,” Bonham Carter (Burton’s real life wife) runs off with the film, stealing every scene she is in lock, stock and barrel. Depp, as always, is madly inventive and imaginative as the colorful but troubled Mad Hatter and Hathaway has nice moments as the sweet natured White Queen. Lucas is a riot as the Tweedles while voice work from Sheen, Fry and Rickman is exemplary. Burton, working with a top notch crew including special effects legend Ken Ralston, Avatar designer Robert Stromberg and multiple Oscar winning costume designer Colleen Atwood, shot in 2D and converted to a brilliantly vivid 3D format with no glitches whatsoever. In short Tim Burton, plus Alice, plus 3D equals an unforgettable, one-of-a-kind movie experience. It will clean up. Cast: Johnny Depp, Mia Wasikowska, Anne Hathaway, Helena Bonham Carter, Crispin Glover, Matt Lucas, Michael Sheen, Stephen Fry, Alan Rickman, Timothy Spall, Michael Gough, Barbara Windsor, Christopher Lee and Paul Whitehouse. Rating: PG for fantasy/action violence involving scary images and situations and for a smoking caterpillar.